These are tough times for investors in gold and even tougher times for investors in gold mining companies. Since the beginning of 2011 (through Aug. 31, 2018), the price of gold, as measured by the continuous CME futures contract) has declined 15.1%. Meanwhile, the two gold miner ETFs – GDX and GDXJ (the junior miners) – have lost 68% and 79% of their value, respectively. Most of the difference in performance between gold and gold miner stocks is due to the impact of operating leverage on the financial performance of the gold miners. Over the past eight years, gold prices have come down while the miners’ per ounce production costs have risen. Unit sales volume has also fallen due to the decline in gold demand. While the miners have adjusted their cost structures, high fixed costs spread over less production have helped raise average per ounce production costs. With the combination of lower prices and higher production costs, most miners have suffered gross profit declines in excess of 50%. The high operating leverage suggests that gold miner shares offer greater upside potential than bullion or ETFs; but the flipside is also true: If the price of gold continues to decline, gold mining stocks will continue to underperform the metal. The Price of Gold has been in a downtrend since reaching an all-time high of $1923.70 in September 2011. Although gold held near the high in the initial months after the 2011 peak, it fell 34% from October 2012 to June 2013. Since then, it has been rangebound, trading between $1,100 and $1,400. Technicians view $1,200 as a key support level that was breached temporarily on August 16. Gold closed on Friday (8/31) at 1,206.70. A longer-term view of the price of gold provides some perspective. The chart above shows the real price of gold (in 2012 dollars), derived by applying the Bureau of Economic Analysis’s personal consumption expenditures index (from its Personal Income report) to the nominal price of gold, as measured by the average monthly London PM fixing. After spiking during the Arab oil embargo in 1980, gold entered a nearly 20-year bear market that was punctuated only by a brief rebound from 1985 to 1988. From 2001, perhaps in anticipation of the approaching 2008 financial crisis, gold began an extended climb which last for 11 years until 2012. During this period, the price of gold rose nearly five-fold. After 2012, gold entered a new bear market which continues to today. Gold Demand. The World Gold Council classifies gold demand in four major categories: Jewelry accounted for 52% of total demand in 2017, more than half of which came from China and India. Investment, including bars & coins and ETFs, was 30% of total 2017 demand. In 2017, demand from gold-backed ETFs fell 63%, reducing investment’s share of total demand by more than six percentage points. Central banks represent 9% of demand. Technology, including electronics, other industrial applications and dentistry, comprises 8% of total gold demand. Gold demand declined 7% in 2017 and by nearly 6% in the 2018 first half. A plunge in investment demand, led by gold-backed ETFs has been responsible for virtually all of the decline. U.S. ETF investors have apparently been focusing more on the upside potential in stocks amid expectations of a continuing economic recovery. Similarly, the decline in bar and coin demand has gained momentum in 2018. Dollar strength has crimped demand in certain markets outside the U.S., most notably in emerging market countries. Central bank buying eased in the second quarter, after strong growth in the first quarter. Technology demand continues to grow at a solid 3% annual clip. Roughly 75% of gold demand is satisfied by production from mines. A de minimis amount of supply represents net hedging from gold producers. Over the past two years, producers have been letting hedges roll off. The bulk of the remaining 25% of supply comes from recycling. In 2017 and in the 2018 first half, supply exceeded demand by an increasing percentage. The Bottom Line: Given the recent dynamics of supply and demand, a reversal of the plunge in investment demand is necessary to support a higher price for gold. 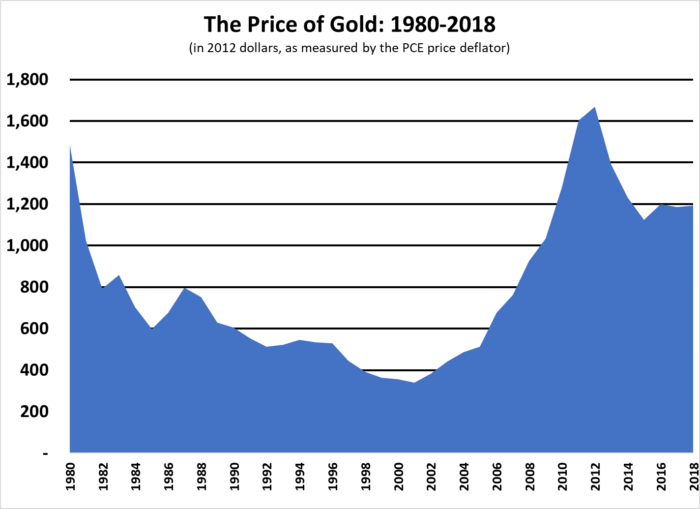 Although some market watchers attribute the weakness in gold to dollar strength, the relationship between gold and the dollar has historically been tenuous at best. That said, sharp currency moves can be a catalyst for a change in the price of gold. This entry was posted in Materials and tagged gold, gold mining stocks. Bookmark the permalink.